The rim system for trucks, buses and trailers, already long established in the market, has now been further developed into a high-precision, individual safety component in 20" and 24" size segments for single and dual tyres. Vehicles equipped with disc wheels can be converted to our TRI-RIM® system (20" and 24"). The TRI-RIM® system is comprised of parts, each of the best quality in regards to tolerances and mechanical properties. The complete system is proven and certified by renowned test laboratories, where it is tested under very tough operating conditions to ensure the required ruggedness and highest degree of safety. Since 1935, TRI-RIM® rims for the three parted rim system have been produced with high quality material from the same German profile manufacturer and have been proving themselves worldwide ever since, even under the most extreme, strenuous conditions. 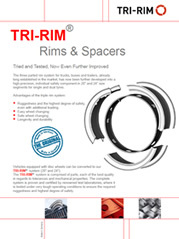 All rim segments are compatible with the existing rim systems. The rim segments are made of a higher quality material with an approx. 15% higher yield strength. 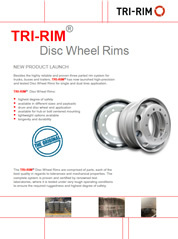 Making the TRI-RIM® rim even stronger, more durable and longer-lasting. The rim segments are comprised of hot-rolled and hot-formed structural steel. Thus, they do not have any destructive residual stress and feature high brittle fracture resistance as well as extremely precise dimensional accuracy. Ultimate tensile strength: min. 430 MPa with a very narrow scatter band The payoff: the use of TRI-RIM® rim segments increases the load-bearing capacity of the wheel and reduces wear and tear, particularly at the front ends of the segments. 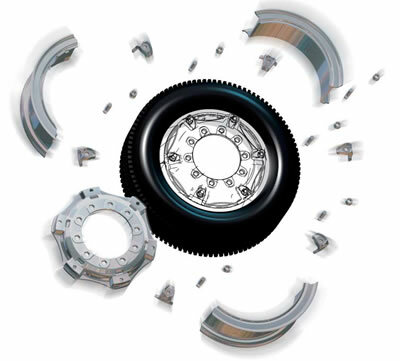 TRI-RIM® has a fine-grained structure that gives it a high degree of brittle fracture resistance. Notched impact strength values from min. 27 J at -20° C are easily attained, making use at lower ambient temperatures possible as well. 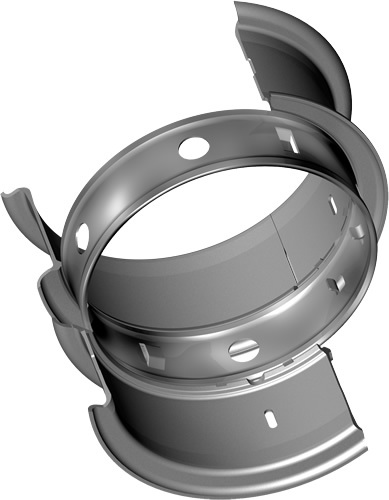 Due to the normalizing heat treatment forming process used for the segments, TRI-RIM® exhibits a significantly lower residual stress level as compared to cold-formed segments. The segments thus retain their shape during driving and the wheels achieve continuous optimal concentricity. The primer and varnish used for the TRI-RIM® segments provide improved corrosion protection. The salt spray test proves it. 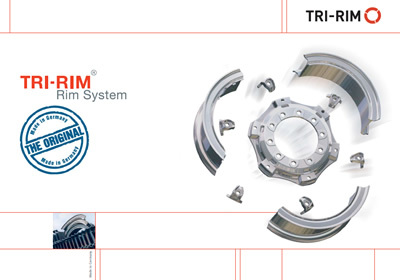 The high reproducibility and consistency of our modern production plants guarantee total uniformity of all TRI-RIM® rim segments. This also ensures excellent concentricity of the wheels.